click on the image for more information on Deanna Durbin Sgt William Greenwood was a member of the crew of a Blenheim IV aircraft of No.82 Squadron, serial number R2772, code letters UX- (UX signifies 82 Sqn, evidently the letter that would have come after the dash was not recorded) Royal Air Force which was shot down on a daylight raid on Aalborg in Denmark on 13th August 1940. It took off from RAF Watton, in Norfolk, at 0840. It was shot down in the target area. All the crew were wounded and taken into captivity. Bill was in a number of camps including Stalag 357 Kopernikus and his POW number was 294. 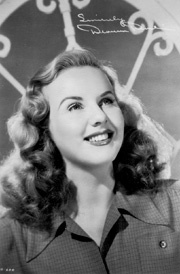 His favourite star was Deanna Durbin. Bill is a member of the RAF Ex-POW Association, living in the Manchester area. 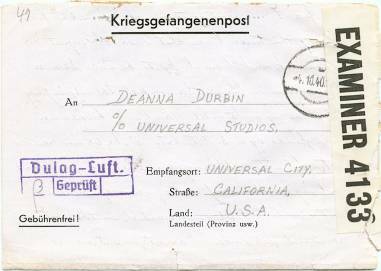 He was amazed that his mail to Deanna Durbin has turned up in the hands of collectors in the USA. Thanks to Tom Richards thomasr1ATohiodominican.edu (replace AT with @ before sending email) and Bill Greenwood for permission to show these letters. Here I am writing to you once again but from Germany this time. I was shot down 13th August in Denmark and I am lucky to be alive because I came down in flames, then crashed. The only injury I have is my right ankle which was broken in three places by a bullet, but will be OK in another fortnights time. When you answer will you please send my (sic) another snap shot of yourself because I lost all I had when I crashed in the water. In this hospital where I am at present, we are well fed & treated. I don't have to work unless we want that is because we are sergeants. I hope you are still doing alright in films, and you will always be the tops with your looks & your voice you can't be anything else. I am looking forward to the day when you and I will meet, which will be another 5 years at the least, unless you come to England before that. I don't know what the weather is like in America, but here it is getting colder every day & another two or three weeks should bring the snow along. Would you please write to me every fortnight or at least once a month. I will be doing the same to you. Close, wishing you and your FATHER and MOTHER the best of luck, Health and Happiness always. married name at that time. This is your old friend Bill writing a few more words to you, and hoping that you are still in the best of health and enjoying married life. Well your first wedding anniversary is rolling along, April 18th if I remember correctly, and I hope that you have many more together. 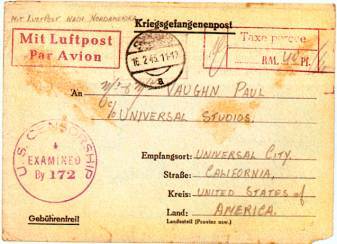 Yesterday I received my second letter from Lillian Russell, who is a secretary to one of the producers at Universal Studios, and head up of a letter-writing committee of girls who try to keep in touch with the boys from around Hollywood who happen to be in the service. She also said that you now looked more beautiful since your marriage and that your voice was still perfect. Hope that you will send me some "stills" from your film titled "Forever Yours." She gave me quite a bit of news - Gable now being a Lieutenant, Bob Stack, Henry Fonda, etc., are now in the Service. Now that space has run short, I close wishing you all the best of luck, health, and happiness always, and please continue to write.